From the thousands of matches ever played by Stoke City, stretching from the club's Victorian foundation across more than 150 years to the Premier League era, here are 50 of the Potters' most glorious, epochal and thrilling games of all! Expertly presented in evocative historical context, and described incident-by-incident in atmospheric detail, Stoke City Greatest Games offers a terrace ticket back in time, taking in Wembley victories, promotion parties and famous triumphs, as well as a wealth of fantastic stories from less 'glamorous' victories down the leagues. An irresistible cast list of club legends - Stanley Matthews, Tom Slaney and Jimmy Greenhoff, Mark Stein, Gordon Banks and Jimmy Broad - springs to life in these thrilling tales of goalscoring feats, great comebacks, last-ditch survival efforts and the odd glorious yet crushing disappointment. In all, a journey through the highlights of Potters history which is guaranteed to make any fan's heart swell with pride. Simon Lowe has written more than ten books about his beloved Stoke City FC, including Stoke City Match of My Life, Potters at War and a collaboration with Denis Smith on his autobiography Just One of Seven. 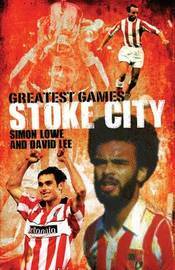 Greatest Games is David Lee's third book on the Potters, his first being the best-selling You Could'ner Make It Up.